Organizing your work orders and managing the follow up process has never been easier - thanks to InLoox PM work management features. Generate quotes, work orders and manage the billing process fully integrated in the familiar user interface of Microsoft Outlook. InLoox PM is a project based work management software: every work order is part of a project that receives an individual budget. Our software not only supports you estimating project costs and composing quotes for potential customers but also helps you manage expense and revenue calculations. A simple tool for managing services range and product inventory complete the work management software. The easy-to-use product directory offers comfortable customization options that allow you to define all cost relevant aspects like labor expenditures and lot sizes as needed. 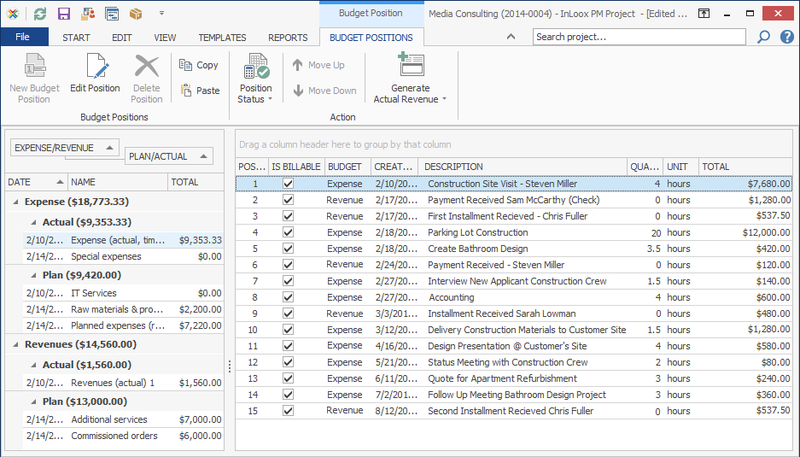 Each budget position is attributed a unique order number, making it a lot easier to trace project costs and simplifying the final accounting process. InLoox PM work management software facilitates continuous accounting of completed work packages in only one simple click. Once a work package has been billed to a project, the respective work package is automatically highlighted on the project cost overview, ensuring that no more project costs get lost in the documentation. Easy Work Order Management | Outlook Intergrated Task Management | InLoox • Copyright 1999-2019 © InLoox, Inc. All rights reserved.